Pure K9 premium optic crystal Deco Diamond Tower polished to perfection. Available in three sizes. Delano is part of the Chien J. Wang Collection designed by international designer Chien J. Wang. 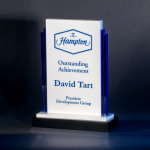 The Delano Crystal & Stone Award is blue, white and black made of optic crystal and stone. The focal point is white stone with blue crystal strips on each side. The piece sits on top of white stone and black crystal. Pure K9 premium optic crystal trophy in a triangular shape with artistic cuts. This beautiful piece is sure to stand out. Jade Glass Award Deluxe Beveled Round Plate with Crystal Holder Base Optical Crystal base included in separate gift box. The Denton Square can be customized to any event and is an ideal giveaway gift. 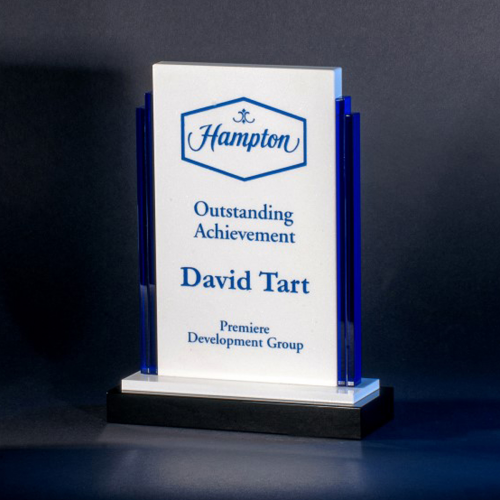 Consider this item for an employee years of service anniversary, a company celebration, or to commemorate a special place or event. 3-1/2" x 2-1/4" x 3/4"
Pure K9 premium optic crystal clock. The edges on the front of this clock is rounded. Plenty of space to engrave your special message. Production lead time for this clock is 1 day. A beautiful desk clock collection made from piano finish wood. Shown on the left, this desk clock measures 4 1/2" wide x 1 5/8" deep x 5 1/4" tall with 2 7/8" x 7/8" engraving plate included. Visible on the right, this desk clock and pen set is also made from piano finish wood measuring 9 5/8" wide x 4" deep x 5 3/8" tall with 3 1/4" x 3/4". Both desk clock awards are simply stunning presentations for employees, sales person, associate, clients and affiliates.